With $0 down, you pay just $84 weekly when financing for 84 months. Come and see us today to take advantage of this great offer. 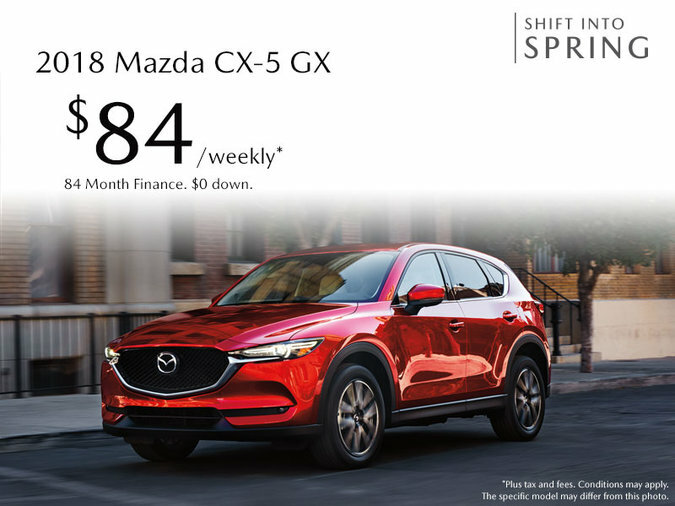 ▼ Shift Into Spring Credit offer (value up to $1,000) is available to qualifying retail customers who cash purchase/finance/lease a select new, in-stock 2018 and 2019 Mazda model from an authorized Mazda dealer in Canada between March 1–April 30, 2019. Amounts vary by model: $300 on all 2018 Mazda3/Mazda3 Sport, on all 2019 CX-3 and on all 2018 & 2019 CX-5 models. $475 on 2019 MX-5 ST GS models. $750 on all 2018 MX-5 ST/MX-5 RF, on 2019 MX-5 ST GS-P & GT, on all 2019 MX-5 RF models. Maximum $1,000 on all 2018 Mazda6, on all 2018 & 2019 CX-9 models. Shift Into Spring Credit applied before taxes. Some conditions apply. NOTE: Shift Into Spring Credit offer not available on 2019 Mazda3 models. See dealer for complete details. †Fuel economy ratings for the GX model taken from the 2017 CX-5 GX. Fuel economy ratings for the 2018 CX-5 GX will be available with vehicle release. ♦TSR functionality may not be compatible with all regional road signs in Canada. ®Bose is a trademark of Bose Corporation, registered in the U.S. and other jurisdictions. ® Bose, ® Centerpoint and ® AudioPilot 2 are registered trademarks of Bose Corporation. ® Bilstein is a registered trademark of ThyssenKrupp Bilstein GmbH. ® HomeLink and the HomeLink house are registered trademarks of Johnson Controls, Inc.
TM “SiriusXM”, the SiriusXM logo, channel names and logos are trademarks of SiriusXM Radio Inc. and are used under license. The APR calculation accounts for cash incentives that are not available to customers who lease or finance through Scotiabank at a special rate of interest. If you would like to lease or finance through Scotiabank at a standard rate of interest (not a special rate of interest), then you may be able to take advantage of such cash incentives. See your Mazda dealer for details. *Lease down payment (with trade‐in) may not reduce Capitalized Cost to lower than $3000 over Residual Value. Minimum balance to finance is $7,500. See your local Mazda dealer for full purchase finance and lease details. §Trade-In Value must be determined by delivering dealership. Please note that the combined down payment and trade-in value cannot result in a lease amount of less than $3000 (i.e. selling price before tax less residual value must exceed $3000). Please see dealer for details. ‡This fee is charged on all new vehicles equipped with air conditioning and paid to the federal government by Mazda Canada. ★When new tires are placed on a vehicle as part of a sale agreement, the purchaser is required to pay an advanced disposal fee of $4.50 per tire (including the spare tire if applicable). ■When financing or leasing a vehicle, this fee is charged for registration under the Personal Property Security Act.